It was very good luck that led us to the J-Six Equestrian Center last spring. 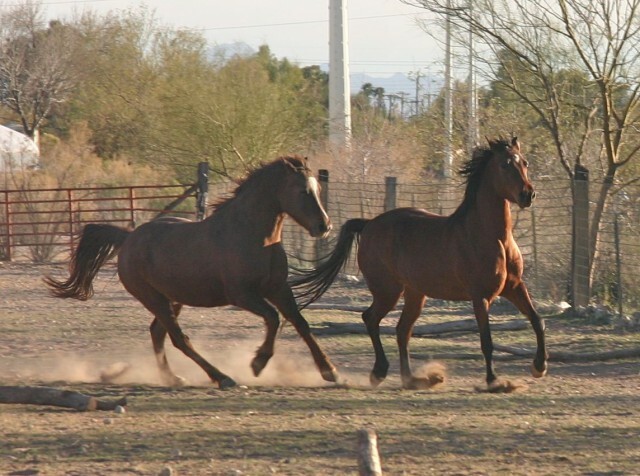 Thinking my husband and I were permanently moving from the southwest, I was looking for short term boarding for our two horses, out of the heat of Tucson and accessible to long distance truckers. I visited J-Six Equestrian Center, a desert boarding facility right along I-10, the east–west interstate across southern Arizona, and realized immediately I had found a special place and a safe place for our animals. What I didn’t realize was that the horsewoman in charge of the barn was an excellent teacher recognized for both her work with riders and her training of their mounts. And though I saw “Rehab” along with “Boarding” in the barn literature, I had no idea that I’d be back in Arizona with time to learn for myself how much it is that Katherine Calkins offers the equine world, or that she would apply her thoughtful rehabilitation abilities to the saving of our horse. The J-Six facility, a 13 acre complex just west of Benson, Arizona, is located not far from the J-Six Ranch Road, in a neighborhood of large acreage development homes and open spaces still associated with the cattle ranching that brought settlers to Arizona over one hundred years ago. Five years ago when Katherine Calkins and her team moved to J-Six, they found stalls, paddock and arena fences, and the necessary support buildings all in place.